Good morning!!! YAY!!! Friday is finally here, and that's a good thing for a number of reasons! Of course the obvious and that is that the weekend is upon us and hopefully it will be filled with good things like graduations, graduation parties, Mother's Day, and just relaxing and enjoying time with family and friends. 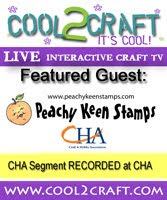 The OTHER good thing about Fridays is the Peachy Keen Stamps Challenge! One of my all time favorite challenges are sketch challenges, and that's what we have for you today. A FANTASTIC challenge for you to play with, if you're lucky enough to work in some crafty time within the next week. Here's the card I created using the sketch. I used the April SOTM stamp set from Peachy Keen Stamps for the cupcake and party hat, but the face for this cutie comes from the new PK-114 Hot Diggety Dog stamp set. Those eyes are so SUH-WEET and I thought the scallop on the icing made a pretty cute and subtle smile for this cutie. The cupcake wrapper was paper pieced and everything was stamped with Memento ink and colored with Copic markers. The patterned paper is all from my scrap bin, and the embossed layer is an embossing folder from Stampin' Up!. Here's what the original sketch looks like and details about the how to play along. Create a card or layout using the provided sketch! Remember, you don't have to use our stamps to link up, but they are required to earn TOP PEACH! You can drop by the Peachy Keen Stamps Challenge Blog for some incredible inspiration from my fellow PKS Designers, and that's where you'll link up your project. It's SUCH a great set for the summer, think of the ADORABLE invites and host gifts you could make! Thanks for stopping by today! I hope you have a glorious day and weekend! Happy Mother's Day to ALL the moms out there, and HAPPY STAMPING!!! That cupcake is just too cute. love the pom pom. Love the soft colors on your beautiful cupcake. Those are sweet eyes! So Pretty. I love the way you Color.